Last year I created a blog entry "Understanding all the Application and Desktop delivery solutions in 30 minutes". Together with this blog entry a graphical diagram of all the different delivery concepts was created as well. The Application and Desktop delivery market space is rapidly evolving in many ways. Last year I created a blog entry "Understanding all the Application and Desktop delivery solutions in 30 minutes". Together with this blog entry a graphical diagram of all the different delivery concepts was created as well. The Application and Desktop delivery market space is rapidly evolving in many ways. I want to share the updated (v2.0) grahical illustration and explanation with you. There are many changes made in this illustration. 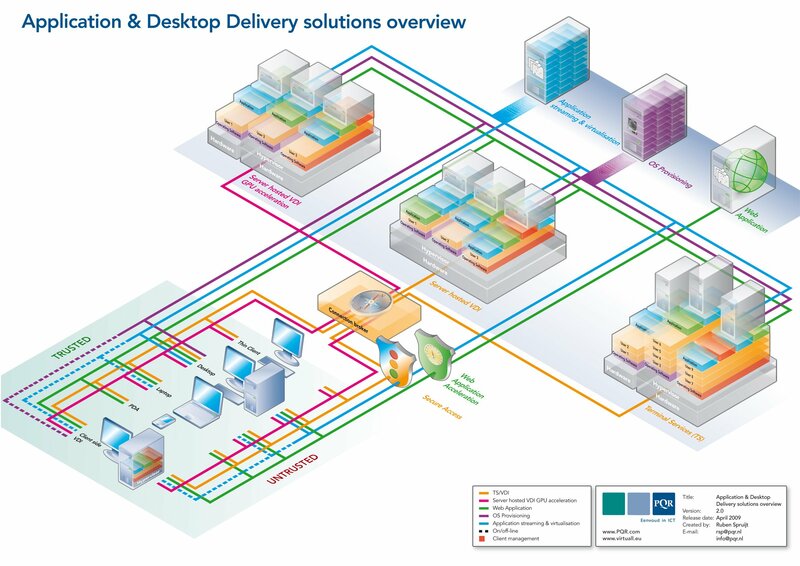 I am sure this diagram will cover the application and desktop delivery concepts for upcoming 1-2 years. This “Application & Desktop Delivery Solutions Overview” to provide a full at-a-glance outline of the various application and desktop delivery solutions. Reading this blog entry ent, which accompanies the Overview, will only take about 30 minutes, and will give you a complete outline of the diagram* and all the application and desktop solutions that are included in it. There are so many delivery solutions available on the market that - often due to a lack of knowledge - their functionalities are frequently mixed up. This article does not aim to describe all application scenarios or their technical advantages and disadvantages, but to give a general idea of the state of affairs in the application and desktop delivery segment, independent of vendors. I hope this overview will be of some value to you. Trusted work places are devices that are connected to the existing IT backend infrastructure via wired or wireless LAN/WAN. Untrusted work places are devices that do not have a secure wired or wireless LAN/WAN connection to the existing IT backend infrastructure. This is, for example, equipment that is connected to a separate network segment for security reasons or because it is used from home or at a work experience location. Secure Access solutions provide secure access for untrusted devices to corporate IT. The two parts of the symbol stand for secure (the shield) and access (the traffic light). Depending on the chosen solution, secure access can also be fine-grained. Solutions that can be used to realise secure access scenarios include Cisco ASA, Citrix Access Gateway, Microsoft Intelligent Access Gateway, and Juniper SSL VPN. Web Application Acceleration appliances accelerate and secure web-architected applications. We are all confronted with these solutions nowadays: internet applications such as Google, MSN and eBay all use them. Web application acceleration solutions are not just useful for large organisations; however, you could also use them for your own web applications. Solutions that facilitate web application acceleration and security include packages such as Citrix Netscaler en F5 BigIP. The connection broker determines which server-hosted remote desktop will be made available to the client. When using a server-hosted virtual desktop infrastructure for this, it is possible to either designate dedicated desktops or a pool of remote desktops. The desktop broker can automatically create, remove or pause remote desktops. There are a number of connection broker suppliers. Citrix with XenDesktop, Microsoft with Remote Desktop Services, and VMware with View are the best-known total solutions. Depending on the supplier, the connection broker may have additional functions, such as a web interface that can create secure (SSL) connections to remote desktops, and also Directory Services integration, Full USB support, support for various display protocols and integration with Terminal Services. Depending on the rules, it is possible to execute applications centrally on a server-hosted VDI or on a terminal server. Through application streaming and virtualization, Microsoft Windows applications can be used without changing the local operating system or installing application software at a particular work place. In other words; the application can be executed as if it had been installed locally and can save data and print without the need of any modifications to the local client. Resources such as the CPU, memory, hard disk and network card take care of the execution of these applications. Application Streaming and Virtualization can make applications available to desktops, laptops, server-hosted VDIs and terminal services platforms. The applications are executed on a “client” platform, without needing to modify the platform. The advantages of Application Virtualization include: installation, upgrade, roll-back, delivery speed and the ease of application support (management). Installation of applications is no longer necessary, eliminating the possibility of conflicts. The result is a dynamic application delivery infrastructure. Application Streaming and Virtualization solutions include: Microsoft App-V, VMware ThinApp, InstallFree, Symantec Workspace Virtualization and Citrix XenApp client side virtualization. OS Provisioning allows workstations to boot up and run from a central image. A single image can be used simultaneously by multiple workstations. The advantage of this is that complete operating systems, including applications and clients, can be made available quickly and securely. It is possible to make a single image available to multiple VDIs, TSs and physical desktop environments without causing conflicts. As a result, it is possible to upgrade or roll-back an OS quickly, simply, and without significant risks. When virtual desktops use OS streaming, (valuable) storage is saved, and the management of virtual desktops becomes relatively simple. This means that virtual or physical machines using OS Provisioning can become “stateless devices”. Citrix Provisioning Server and the VMware View Composer are both solutions that facilitate OS Provisioning. There are two kinds of VDI: server-hosted and client-side. A Server-Hosted Virtual Desktop Infrastructure (VDI) is a dedicated remote desktop solution providing remote access to Windows XP/Vista/Win7 or Linux desktops. The virtual machines are run from the data centre. The virtual infrastructure increases the system’s independence, availability and manageability. The implementation of Server-Hosted VDIs means that desktops are no longer bound to a location or end-user appliance. Each user has his own unique, personalised, fully independent work place. Programs run and data is processed and stored on a centralised personal desktop. The information is sent to the client screen via a remote display protocol such as Microsoft RDP, Citrix ICA, Teradici/VMware “PC-over-IP” or VNC. The protocol used for displaying the correct information depends on the operating system, bandwidth, the type of application, and the technical facilities. As with other desktop delivery solutions, VDI consist of various infrastructure components that facilitate management, load balancing, session control and secure access to virtual work stations. Microsoft, VMware, Quest and Citrix are all important suppliers within the server-hosted VDI segment. The “Graphical Processor Unit (GPU) acceleration” functionality can be added to the server-hosted VDI solution. It provides each (virtual) machine with enough graphic performance to run multimedia, 2D/3D, NextGen and Unified Communications. Display data is presented to the client device via an optimized remote display protocol. To ensure that the end-users experience the best possible performance, the bandwidth, latency, or local (software) components have to meet extra requirements. There are two kinds of VDI: server-hosted and client-side. Client-side Virtual Desktop Infrastructure (VDI) is a dedicated local desktop. The virtual machines are run locally on the client device. The hypervisor ensures that each virtual machine is hardware-independent, and makes it possible to simultaneously use a number of virtual machines at the same workstation. The hypervisor plays an essential part in client-side VDI solutions. There are two kids of hypervisor: a bare-metal client hypervisor and a client-hosted hypervisor. The client-hosted hypervisor is installed on the Windows, Apple of Linux operating system as an application. The bare-metal client hypervisor is installed on top of the hardware, with the operating system installed on the hypervisor. The main differences between the hypervisors are hardware support, performance, manageability and end-user experience. Citrix XenClient, VMware Client Virtualization, Neoclus en Virtual Computer are all bare-metal client VDI solutions. Microsoft VirtualPC en MED-V, VMware ACE and Fusion, Parallels Desktop, and Sun VirtualBox are client-hosted VDI solutions. Any self-respecting professional IT organisation is bound to use a Client Management solution, as it is needed to facilitate things such as OS deployment, patch management application and client deployment, asset management, service desk integration, and remote control. Examples of client management systems are Microsoft System Center Configuration Manager (SCCM), RES Wisdom, Altiris Deployment Solution, LANdesk Client Management and Novell ZENworks Configuration Management. Client Management is one half of the complete picture. The complete picture is User Environment and Client Device management.. (To be continued). The solutions given in this overview all provide different ways of making applications and desktops available effectively and dynamically. Which solution is best for your organisation depends on a number of variables. Each company has different requirements and different technological circumstances, and together they determine which solution is best.